Past and current members of the legendary Gaither Vocal Band come together for this inspirational concert, performing Gospel favorites such as "He Touched Me," "Satisfied," "Passin` The Faith Along," "I Bowed on My Knees. ", "Home," and "The Love of God." 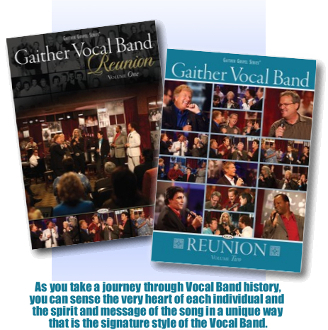 Volumes one and two of the celebration includes appearances by Steve Green, Michael English, Lee Young, Mark Lowry, Jim Murray, Jon Mohr, David Phelps and many more. Performances include these songs.. and more: He Came Down To My Level, Your First Day In Heaven, New Wine, Satisfied, I Bowed On My Knees, He Touched Me, There Is A River, Gentle Shepherd, Let Freedom Ring, Loving God, Loving Each Other, Temporary Home, Dream On, Build An Ark, The Love Of God, I Walked Today Where Jesus Walked, Find Us Faithful, Mary, Did You Know?, Oh, What A Time! This DVD set includes 2 DVDs: VOL 1 and VOL 2.